The efficient management of your assets and your teams is a crucial stake as it is	resolutely complex. The surveillance and the control of your buildings are based on	an optimal interoperability and require reactive systems as well as proactive teams. Nowadays, the large beam of solutions covering all the functions related to the healthy management	of you enterprise rests on a wide range of procedures. Intruder alarms and fire detection systems as well as CCTV and home automation have to stay focused on their specific mission. Fully managing and securing your buildings require a huge amount of functionalities however big	they are. Through the non-exhaustive and full integration of your systems we are able to drastically reduce surveillance costs and at the same time to considerably improve the average security level within your organization. 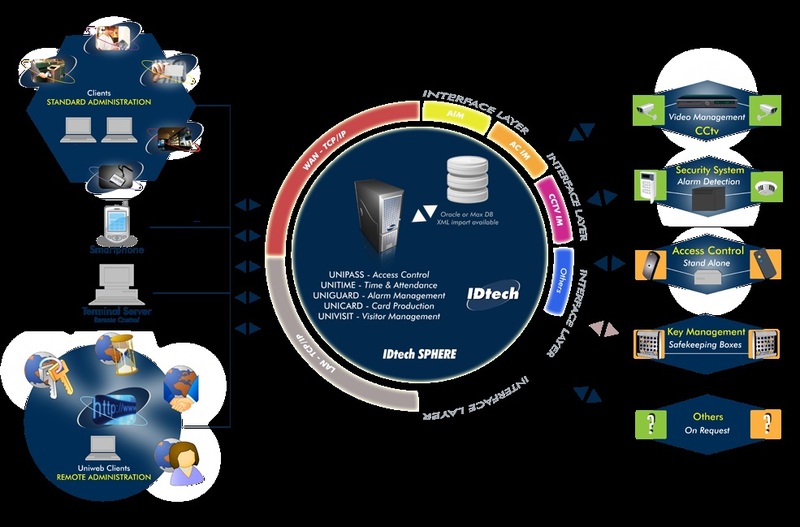 For the IDtech teams, no problems of assets or personnel management are too complex. We answer	all your questions at once. The concept which is at the origin of our products and services has	been launched more than twenty-five years ago and still rests on the integration of various	technical elements: Intruder and fire alarm, CCTV, Access Control, Time & Attendance, Card Production and Visitor Management solutions. Flexibility remains our key word. Our fully integrated software suite is unique and offers an unrivalled modularity level. We are convinced that this is the adequate response to the vast majority of your safety and security issues. The IDtech solution is an incredible all-in-one. Thanks to various technology combinations as well	as the hosting of all required information on a relational database, we can gather all actions connected with your buildings and personnel administration on a single platform. Day by day, we work with a wider provider and partner network. Our main goal is to meet your	integration needs through the installation of reliable and flexible solutions. These will allow you to rationalize the amount of processes while protecting your already existing investments.